Armed Forces Day is all about celebrating the courage of our living service men and women, both serving and retired. It’s our chance to say thank you for their service to our country and to tip a nod to the bravery and endurance of their families. Gordon Brown first introduced the concept of Veteran’s Day in 2007, to ensure we, the public, never forget. Two years later, it was renamed Armed Forces Day. Held typically on the last Saturday in June, 2015 promises to be a bumper year for organised events. There’s bound to be one taking place near you so check out the local press and don’t miss out!. For the last few years, the official celebration has been held in Cardiff, Edinburgh, Plymouth, Nottingham and Stirling. This year, it will be taking place in Guildford, Surrey on Saturday 27th June. 1. What’s going on at the National Event? Armed Forces Day will start with a service in the Cathedral (you’ll need a ticket to get in). Then at 11.30 there’s a parade from the bottom of Guildford High Street to Stoke Park where an awesome show will unfold. A great line up of live music include headline act The Jam, featuring Bruce Foxton; The Patriot Girls; and the Ministry of Defence Band. 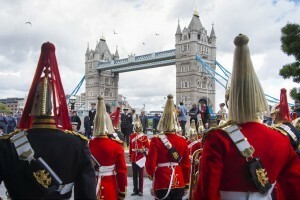 Look forward also to military displays to capture the imagination and a visit from HRH The Duke of York, KG. The Parade and entry to Stoke Park are free for all to enjoy, with no tickets required. For more information about this fun packed day, go to www.guildfordarmedforcesday.co.uk. Local events: a chance to celebrate at an event near you…. If Guildford is a bit too far away, here are a few ideas to whet your appetite. Get inspired and show your support for our troops on this very special day. There will be a full program of events and activities for all the family at the National Memorial Arboretum. Peaceful woodland, entertaining activity! Watch the Trooping the Colour and a Freedom Ceremony at Whately Hall, led by the celebrated Band of the Irish Guards and the 142 Vehicle Squadron Royal Logistics Corps. Music and marching to stir the blood! Not just a day, here they’ll be holding an Armed Forces Weekend. Featuring a military parade plus concert with plenty of flag waving on the Saturday, then a family day on the Sunday. Take the kinds out to enjoy the stalls, fairground rides, an assault course and an air simulator – just a few of the attractions. Show your support for the serving military personnel, veteran associations and cadets who will be parading down Union Street to the tune of the local pipe bands. This rousing celebration of Armed Forces Day will culminate in family activities at the Queens Links. The North Devon Veterans Association will be hosting a free event. Make your way there to view a fine display of military equipment and memorabilia and enjoy musical entertainment and demonstrations that will keep you and the family busy through the day. Wiltshire Armed Forces & Veterans will be celebrating in style. Great fun to be had watching military vehicle displays, a host of serving and veteran military personnel on parade, with marching bands, re-enactors, a flypast and much more. Relax and listen to live music from the Bandstand with a marching band performing in both the gardens and the town. That’s just a small selection of the many events round the country. To find out more information about an Armed Forces Day event in your area, check out www.armedforcesday.org.uk/find-events.